Renowned Taiwanese director Tsai Ming-Liang attended the 24th edition of the Leeds International Film Festival in 2010, where he received the Golden Owl Lifetime Achievement Award. 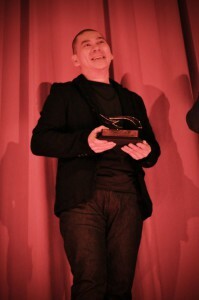 During his time in Leeds, a “Tsai Ming-Liang Study Day” was held at the Centre for World Cinemas , University of Leeds. As well as the photographs above, a follow-up report by organizer Ming-Yeh Rawnsley is attached, with links to media coverage, and there is also a link to an interview Dr. Tiago de Luca of the University of Liverpool conducted with Tsai.